In a world characterized by sluggish economic growth, Africa is often presented as the continent of the future, with average growth of around 5% annually that has remained constant, even during the global financial crisis. Indeed, the continent has considerable potential, with a diverse range of natural resources that are as yet scarcely exploited: extractive recourses, timber, arable lands, etc. However, if the continent hopes to attract investors, it will be necessary to develop infrastructure. Inspired by the example of the economic dynamism of the newly industrialized countries of Asia, South America and even Africa, numerous countries on the continent now aspire to reach the status of emerging economies themselves in the span of a generation. With the assistance of financial institutions and/or private investors, these countries have embarked on ambitious infrastructure construction programmes, in the telecommunications, energy and transportation sectors. In a 2010 report entitled Africa Infrastructure: A Time for Transformation, the World Bank conducted an in-depth assessment of the situation of the continent. Among other observations, the report stated that over half of the growth increase in Africa could be attributed to infrastructure, and that this percentage would rise in the coming years. It also estimated that, in order to develop the infrastructure it needed, the continent would have to invest USD 93 billion annually, a third of which would be required for maintenance. The impacts of this strategy on the environment and on the rights of the poorest sectors of the continent’s population, who very often depend on natural resources for their survival, are not always sufficiently considered, and it is likely that rural communities will end up paying a very high price for the development of infrastructure. The aim of this article is to illustrate, through two infrastructure projects in Cameroon, some of the far-reaching implications of these projects and the risks associated with them. Initiated in 2000 to transport the crude oil produced in southern Chad (the Doba Basin) to Kribi, on the Atlantic coast of Cameroon, this 1.000 Km pipeline was, at the time, the biggest infrastructure project ever undertaken in sub-Saharan Africa. The countries that received this investment, Cameroon and Chad, had no prior experience in conducting and monitoring environmental and social impact assessments for projects of this scope. Due to the participation of the World Bank and the International Finance Corporation (IFC), the project’s financial partners, the criteria used for the impact assessment, the compensation scheme for local communities, the appeal mechanisms, etc., were those of the World Bank. And despite the international public opinion’s especial attention to the project due to the controversies surrounding the preparation and approval phases, it eventually became clear that the social and environmental mitigation measures did not function as foreseen, and that these shortcomings had led to negative impacts, sometimes unforeseen, but already irreversible. As an example, we could mention what happened to the small fishing community of Ebomé, a village in the district of Kribi located at the point where the pipeline reaches the Atlantic Ocean. This formerly prosperous community saw its local economy destroyed when a reef rich in fish stocks located two kilometres off the coast was blasted by dynamite. Apparently, this reef had not been identified when the impact assessment for the project was carried out, and its destruction did not give rise to any immediate compensation, despite the protests of the fishermen. Five years later, an artificial reef was created in the same spot, but the fish never returned. It should be noted that, for the community of Ebomé, the reef was also a sacred site, the home of the “mami wata” or water spirits, who were responsible, among other things, for attracting the fish and putting them at the disposal of the village. The destruction of the reef was believed to have angered and driven off the spirits. This was not an isolated case, and more than ten years after the celebration of the arrival of the first barrel of oil, numerous unresolved problems continue to arise as a consequence of the pipeline. Two complaints were filed to the World Bank Inspection Panel (2), another two are currently pending before the IFC Compliance Advisor/Ombudsman, which demonstrates that the environmental and social impacts persist until today (3). On October 30, 2013, the governments of Niger and Cameroon signed an agreement for the transportation of 324 million barrels of crude oil from the Agadem oil field in Niger through the Chad-Cameroon pipeline. The government of Niger will construct a 600 Km pipeline from the oil field to connect with the existing pipeline (4). This situation gives the unfortunate impression that the promoters of the pipeline made promises they had no intention of keeping, solely to achieve the construction of the initial infrastructure, after which the others could be built without the need to seek restrictive new financing from international public agencies. While these are different types of infrastructure, they can be viewed as forming part of an integrated system, built by different entities but aimed at the same goal: connecting the depths of the equatorial rainforest and its rich oil reserves with the Atlantic Coast. The high-speed train railway forms part of a project for the exploitation of the iron ore reserves in Mbalam (Cameroon) and Nabeba (Republic of Congo) (5), in the heart of the equatorial rainforest, and TRIDOM, a vast forested area shared by Cameroon, Gabon and the Republic of Congo. The mining concessions will impact on forests, some of which are home to exceptional biodiversity and provide the habitat and livelihoods of numerous communities, while others are targeted for large-scale logging operations. The new railway, stretching over 500 Km, will be used to transport iron ore from the two mining concessions to the port in Kribi. 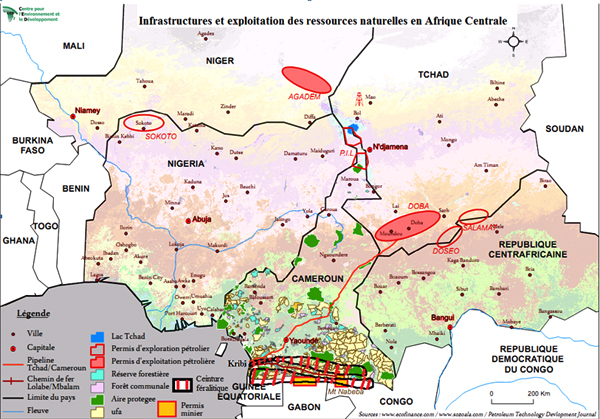 As can be seen on the map below, the south of Cameroon and north of the Republic of Congo and Gabon are brimming with reserves of iron ore and other minerals, whose exploitation will be facilitated by the railway. In this case as well, as in that of the pipeline, the basic infrastructure will serve as the basis for the development of a network of secondary railways, in order to join various scattered concessions to the main line stretching from the Congo to the ocean, facilitating the exploitation of mineral resources throughout the forested area along the equator. And once again, the impact assessments were limited to the main mining area and railway line, without taking into account the other infrastructures that will inevitably be added to those initially constructed. While many lessons can be drawn from these examples, we will mention only a few. 1. Many infrastructure projects are planned, but not all of them have the same significance: some bring about more environmental destruction and rights violations than others; likewise, some are more strategic, meaning that they will serve as the basis for the development of many others. 2. While regulations around environmental and social impact assessments have improved since the construction of the Chad-Cameroon oil pipeline, they still do not adequately deal with the growing complexity of projects, particularly those involving the construction of large-scale infrastructure and the exploitation of natural resources, which imply long-term coexistence with local communities and endanger the foundations of their survival and cultural rights. 3. The fragmented nature of environmental and social impact assessments does not allow for an accurate measurement of the accumulative impacts of the various infrastructure projects. This fragmentation leads to a downplaying of the repercussions of these investments on local communities and the environment, and thus makes them more acceptable. 4. Governments participate in the development and operation of these infrastructures in pursuit of competiveness, a crucial advantage for attracting investment. But in order to do so they incur debt, and those who benefit are the multinational corporations, because the infrastructure facilitates their exploitation of natural resources. It is the citizens who will have to repay the debt, while the corporations take away the bulk of the income generated by the exploitation of resources. And the portion of income that falls to the state is distributed unequally, to the detriment of the poorest, who are precisely the ones who are hardest hit by the impacts of the infrastructure projects. In the case of Cameroon, for example, we are witnessing a massive re-accumulation of debt for these purposes, with much of that debt owed to China. It is more than likely that natural resources will be used to repay that debt. 5. These projects have an especially high cost for the climate: in addition to the greenhouse gas emissions directly associated with infrastructure construction, we must also take into account the emissions caused by the exploitation of resources and, in the case of oil, its subsequent usage. 6. Due to a lack of planning, these infrastructure projects will impose limitations on future land use management and planning efforts. In the end they are not profitable for all, and even less so for the poorest sectors of the population. Moreover, they are particular harmful to the environment. And while these projects may be carried out in pursuit of “development”, it would certainly appear that, in the long run, they result in more problems than solutions. (1) For more information on the project see http://ewebapps.worldbank.org/apps/ip/Pages/AllPanelCases.aspx. (2) The Inspection Panel is an independent complaints mechanism for people and communities who believe that they have been, or are likely to be, adversely affected by a World Bank-funded project.http://ewebapps.worldbank.org/apps/ip/Pages/Home.aspx. For more information on the two cases presented to the Inspection Panel in connection with the Chad-Cameroon petroleum development and pipeline project, visit the following links: http://ewebapps.worldbank.org/apps/ip/Pages/ViewCase.aspx?CaseId=52 y http://ewebapps.worldbank.org/apps/ip/Pages/ViewCase.aspx?CaseId=59. (3) For more information on the cases filed with the IFC Compliance Advisor/Ombudsman, visit the following links: http://www.cao-ombudsman.org/cases/case_detail.aspx?id=168, http://www.cao-ombudsman.org/cases/document-links/links-168.aspx, http://www.cao-ombudsman.org/cases/case_detail.aspx?id=179, http://www.cao-ombudsman.org/cases/document-links/links-179.aspx.